Standard clubs from premium brands are built to the highest performing specifications possible. The standard specifications cover three basic categories Senior, Lady, Men. 90% of golfers will fit one of these categories. 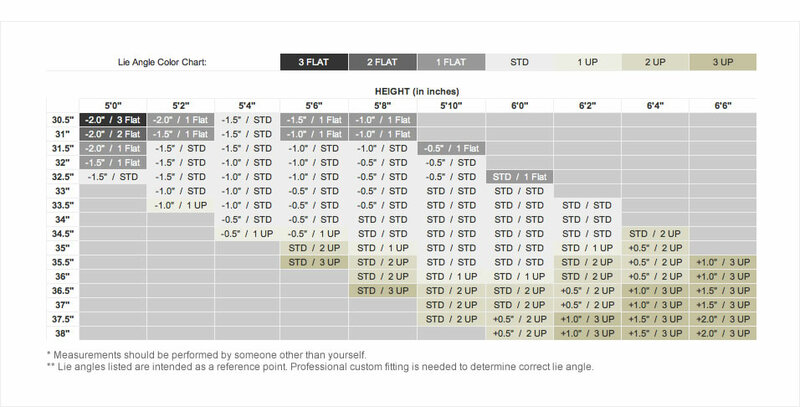 If you feel you do not fit one of these standard categories because of size, strength or physical disability then please have a club fitting session with your PGA professional. Lie angle is the vertical orientation of the clubhead. It affects the direction the clubface is pointing, and thus how the ball leaves the clubface. If the lie angle is too upright, the clubface will point to the left of the clubhead's leading edge. If the lie angle is too flat, the clubface will point to the right of the leading edge. There are two important factors to consider when considering the lie angle of an iron. First, lie angle should be fitted dynamically, meaning that the club fitter should examine the lie angle when the club is impacting the ball. How the clubhead sits at address has no bearing on performance. Second, lie is fitted after shaft length has been selected because length affects dynamic lie angle – every 1/2" of length added makes the iron play 1 degree more upright; the reverse is true for reduced length. Choose a shaft length that allows the player to produce the maximum amount of speed without sacrificing control. Height and a wrist-to-floor measurement (in inches) can be used to determine cusom lengths. Club length can be altered up to one inch longer or shorter. Shaft length plays an important role in club's head speed, path, attack angle and the player's ability to make solid contact. As shaft length increases, clubhead speed also increases. There is a point when the weight of a longer shaft, combined with the awkwardness of controlling the extra length, will result in diminishing clubhead speed. As shaft length increases, it is common for players to deliver the club more from the outside and on a shallower angle of attack. It also becomes more difficult to make solid contact. The shaft length is based on the golfer's height, arm length and posture, as well as consistent clubhead delivery. Most of the time, a golfer who is tall, or has short arms, or both, will make better contact with an over-length club. The same would be true for a shorter golfer using an under-length club. Sometimes a golfer's height and arm length will negate each other and a standard length is the best option. As length is increased, so is the weight. Increasing the length also changes shaft flex. For every 1" added, the shaft becomes one flex softer; likewise, a shorter shaft plays stiffer. Shaft length also affects lie angle.